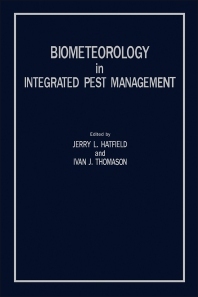 Biometeorology in Integrated Pest Management is a resulting book from a conference with the same title held at the University of California in 1980. This book presents integrated pest management (IPM) in different viewpoints and perspectives. It serves as a helpful exchange of ideas to strengthen the research in integrated pest management. From a biometeorological viewpoint, the microclimate of agricultural systems is introduced in this book to describe the environment in which pests live. The first few chapters in this book discuss IPM in the perspective of biometeorology. Some of the topics include crop canopies (general heat exchange and wind movement), microclimate (instrumentation, techniques, and simulation), and microclimatic stress (remote sensing). The following section of the book focuses on plant pathology. The subject areas covered in this section include radiation quality and plant diseases; management of plant pathogens; and plant canopy modification and impact on plant disease. The last section focuses on weed science. The interaction of weeds to other pests, effects of light and temperature on weed growth, and weed seed germination are some of the topics discussed in this part. This book is a good source of reference to both students and professionals in the field of biometeorology, entomology, and agriculture. Other interested parties in the research of integrated pest management will also find this book helpful in their endeavors.